Grammy winner Adele breaks Lady Gaga's position as her song "Rolling In The Deep" is now the Best Selling Digital Song by a Female Song Artist. Rolling In The Deep has sold 6,679,000 digital copies and counting while Lady Gaga's Poker Face has sold 6,622,000 digital copies. The biggest record is still from The Black Eyed Peas' "I Gotta Feeling", which has sold a total of 7,822,000 digital copies. 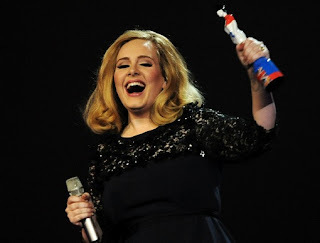 Another feat by Adele was her record for the album 21, which is the Best Selling Digital Album.